Despite its name, heartburn has nothing to do with the heart (although some of the symptoms are similar to a heart attack). 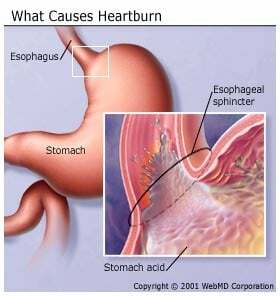 Heartburn is an irritation of the esophagus caused by acid that refluxes (comes up) from the stomach. When swallowing, food passes down the throat and through the esophagus to the stomach. Normally, a muscular valve called the lower esophageal sphincter (LES) opens to allow food into the stomach (or to permit belching); then it closes again. Then the stomach releases strong acids to help break down the food. But if the lower esophageal sphincter opens too often or does not close tight enough, stomach acid can reflux or seep back into the esophagus, damaging it and causing the burning sensation we know as heartburn. Not only can stomach acid in the esophagus cause heartburn, but it can also cause ulcers, strictures (narrowing) of the esophagus and cancer of the esophagus. Most people have felt heartburn at one time or another. In fact, the International Foundation for Functional Gastrointestinal Disorders reports that about 20%, or one in five, of Americans experience heartburn at least once a week. Though uncomfortable, heartburn does not usually pose a serious health problem for most people. However, if heartburn symptoms occur frequently and persistently, it may be a sign of a more serious problem, such as gastroesophageal reflux disease (GERD). GERD is a chronic reflux of acid into the esophagus. Left untreated, GERD can cause a host of complications, including esophagitis , esophageal ulcers , hoarseness, chronic pulmonary disease and Barrett?s esophagus (a change in the lining of the esophagus that increases the risk of developing cancer of the esophagus). Chest pain, especially after bending over, lying down or eating. Burning in the throat -- or hot, sour, acidic, or salty-tasting fluid at the back of the throat. Feeling of food "sticking" in the middle of the chest or throat. Reporting these symptoms to your doctor is usually all that is needed for your doctor to diagnose heartburn. However, your doctor may perform special tests such as endoscopy or pH monitoring to determine the severity of your problem or to monitor your treatment. Bulging of part of the stomach into the chest cavity, also called hiatal hernia . Treating heartburn requires adjustments to your lifestyle, medications, and possibly surgery if your heartburn is due to GERD. Eat meals at least three to four hours before lying down and avoid bedtime snacks. Maintain a healthy weight to eliminate unnecessary intra-abdominal pressure caused by extra pounds. Limit consumption of fatty foods, chocolate, peppermint, coffee, tea, colas and alcohol -- all of which relax the lower esophageal sphincter -- and tomatoes and citrus fruits or juices, which contribute additional acid that can irritate the esophagus. Give up smoking, which also relaxes the lower esophageal sphincter. Wear loose belts and clothing. Heartburn can be treated with medicine. Medicines used to treat heartburn can range from over-the-counter remedies to medicine requiring a doctor's prescription. Antacids. Antacids neutralize excess stomach acid to relieve heartburn, sour stomach, acid indigestion, and stomach upset. They are also occasionally recommended to help relieve the pain of ulcers. Some antacids also contain simethicone, an ingredient that helps eliminate excess gas. Examples of antacids include: Tums, Rolaids and Maalox. You should take antacids exactly as directed by your doctor, or according to the manufacturer's directions. If you are using the tablets, chew them well before swallowing for faster relief. Serious side effects can occur with an overdose or overuse of antacids. Side effects include constipation, diarrhea, change in color of bowel movements and stomach cramps. Acid Blockers. These medicines relieve heartburn, acid indigestion and sour stomach, and are available without a prescription. Pepcid AC, Tagamet HB, Zantac 75, Axid AR and Prilosec OTC are examples of over-the-counter acid blockers. Acid blockers work by reducing the production of stomach acid. Take these medications according to the directions on the package, or as advised by your doctor. Possible serious side effects that need to be reported to your doctor right away include confusion, chest tightness, bleeding, sore throat, fever, irregular heartbeat, weakness and unusual fatigue. Other less serious side effects include mild headache, dizziness and diarrhea, which are usually temporary and will likely go away on their own. People who have more severe heartburn symptoms that aren't relieved with these medications or who have been using these drugs for more than two weeks should contact their doctor. They may need medicine only obtained with a doctor's prescription. H2 Blockers. Histamine-2 (H2) blockers such as Pepcid, Tagamet, Zantac and Axid work by reducing the production of stomach acid. The prescription forms of these medications (which usually contain higher doses than the over-the-counter versions) can generally relieve heartburn and treat GERD. They also may be used for other conditions as determined by your doctor. Proton Pump Inhibitors. Depending on the source of your problem, your doctor can prescribe medications that block acid production more effectively than the H2 blockers, namely the family of medications doctors call proton pump inhibitors, or PPIs for short. They include: Prilosec, Prevacid, Aciphex, Protonix and Nexium. Promotility Agents. Promotility agents work by speeding up digestion, which prevents acid from staying in the stomach too long, and strengthening the lower esophageal sphincter, reducing reflux back up into the esophagus. Reglan is a promotility agent occasionally used to treat heartburn associated with GERD. The side effects of Reglan may include drowsiness, fatigue, diarrhea, restlessness, and movement problems. Another promotility agent, Propulsid, was removed from the market in 2000 because it caused serious heart arrythmias (abnormal heart beat) in some people. Most patients are successfully treated with these medications. Only a few people need surgery to correct the disorder. When medical or drug treatment has failed to control symptoms. When the sphincter muscle is unable to work properly. When esophageal cancer develops from chronic GERD. Reviewed by The Cleveland Clinic Department of Gastroenterology . Edited by Cynthia Haines, MD, September 2004.